Fire up the grill, it’s time for some amazing burgers! 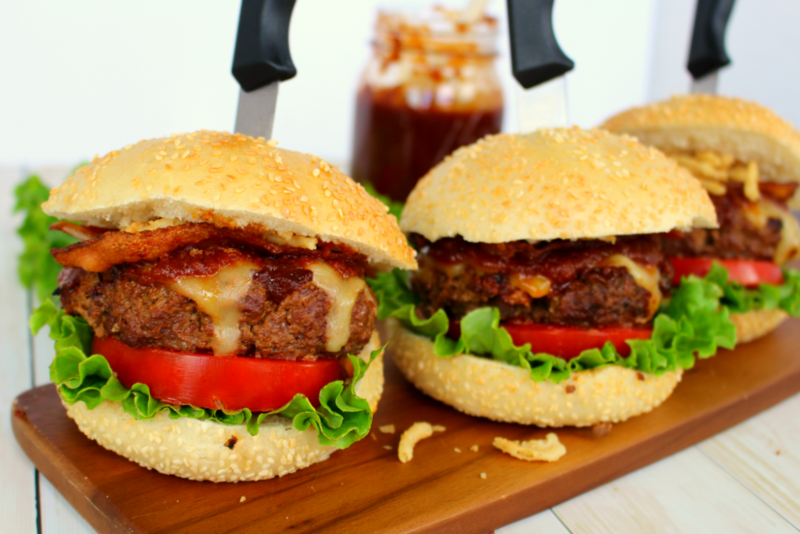 My Smokehouse BBQ burgers are topped with smoked Gouda, bacon, fried onions, and an amazing Smokey Chipotle Barbecue Sauce. 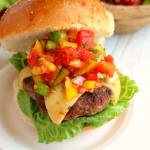 Juicy and super flavorful, you’ll be making these burgers all summer long! Have you fired up your grill yet? Now that the weather is getting warmer, and days are getting longer, its the perfect time to throw some delicious burgers on the grill. There are a million ways you can make a burger – so many different types of meats, not to mention toppings, cheeses, and breads. I’m definitely a traditionalist when it comes to a great burger – I always go with a beef patty, we usually toss on a good cheese, and go from there. 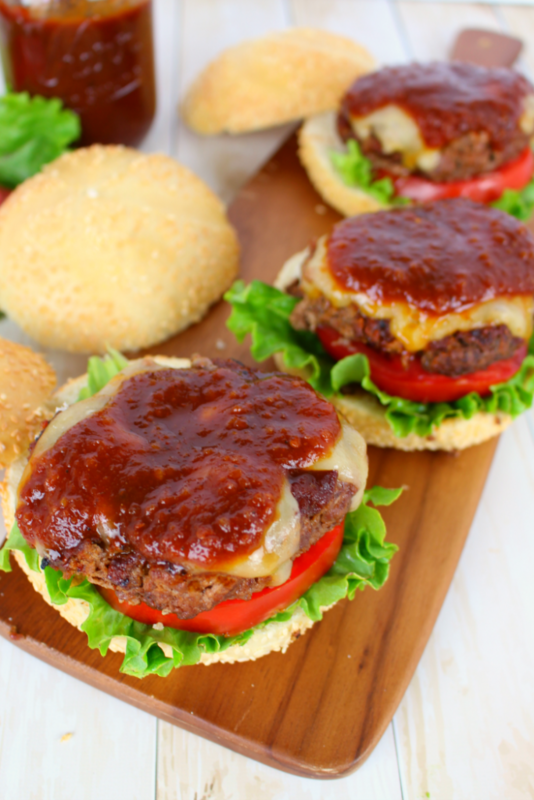 My Smokehouse BBQ Burger is easy one of my favorite ways to make a delicious hamburger! 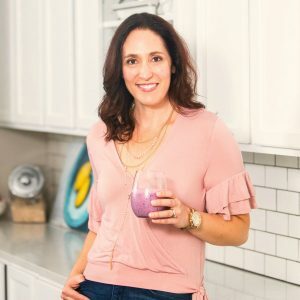 I typically start with ground beef that has a fat content of 10% – 20%. I know this is “fatty” but that’s where all the flavor is! I also like mixing in my Smokey Chipotle Barbecue Sauce into the meat mixture, as well as on top of the patties while they’re cooking on the grill. 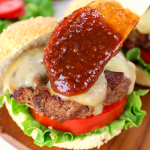 This not only adds to the flavor of the burger, but adds some additional moisture to the meat. From here it’s all about the toppings – for this burger, I added some thick slices of smoked gouda, after flipping the burgers. 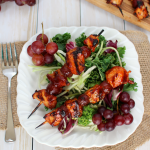 It melts wonderfully, and is the perfect smokey flavor to accompany the sauce. I then add more of my Smokey Chipotle Barbecue Sauce. This sauce is absolutely amazing – not only is it awesome on these burgers, but great on pork chops, chicken and ribs, too! After the cheese and the sauce, its then time to add some thick slices of bacon. 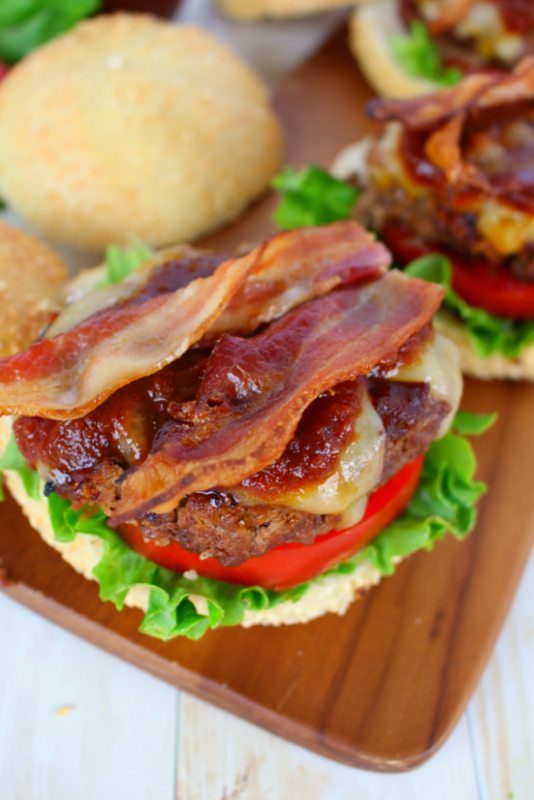 You can really never go wrong with adding bacon, to any burger, am I right?! Top with some french fried onions, and you’ll have the most amazing burger, ever!! Fire up the grill, it's time for some amazing burgers! 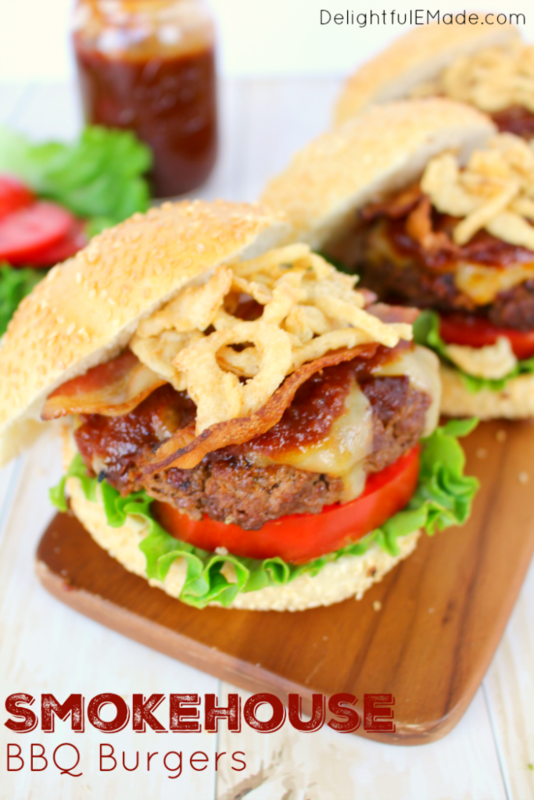 My Smokehouse BBQ burgers are topped with smoked Gouda, bacon, fried onions, and an amazing Smokey Chipotle Barbecue Sauce. 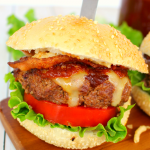 Juicy and super flavorful, you'll be making these burgers all summer long! Heat your outdoor gas or charcoal grill. If you're using a gas grill, set to medium-high heat. In a mixing bowl, place ground beef, mayonnaise and barbecue sauce and mix together well. Divide meat mixture into 4 even balls and shape into patties. Place beef patties onto hot grill. Cook for 5-6 minutes per side. 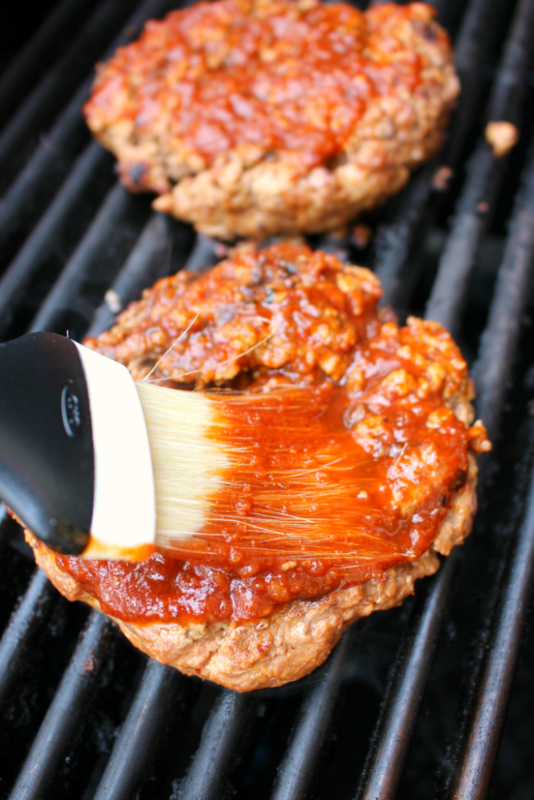 Once you've flipped the burgers once, brush on additional sauce, and add cheese slices to melt. Cook for a total of 10-12 minutes for medium sear. Transfer burgers to buns, and top with additional sauce, bacon and onions. Add lettuce and tomato if desired. Enjoy right away. Gas and charcoal grill temperatures vary. Check the meat of the burgers to desired doneness with a knife. 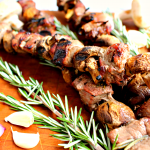 It is recommended to also use a meat thermometer to ensure proper safety in preventing food born illnesses. 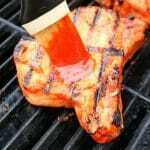 Here is the link to my recipe for the Smokey Chipotle Barbecue Sauce. It really is fantastic! Whenever there's a smokehouse burger on a menu I immediately order it - yours looks divine!! These are one yummy looking burgers. Thanks for sharing at the Inspiration Spotlight party. Pinned & shared. Wow! Those look so amazing and flavorful. I love smoked gouda and who doesn't enjoy some nice crispy bacon on a burger? Pinnned.